India has a wide range of wildlife safaris and national parks, some of which have accommodations in the heart of the reserves. Visitors can take elephant rides or jeep tours to watch the flora and fauna – lions, tigers, crocodiles, elephants, boars, birds, monitor lizards and more – and experience the beauty of Indian wildlife. The spectacular Ranthambore National Park is a 1330 sq km of wild jungle scrub hemmed in by rocky ridges. At its centre is the 10th century Ranthambore Fort, with nearby ancient temples and mosques, lakes and chhatris (cenotaphs). The park was a hunting ground for the Maharaja until 1970, after which it is a wildlife sanctuary. Ranthambore is the only place to spot wild tigers in Rajasthan and Project Tiger has been in charge of the animals’ welfare since 1979. The project has been thrown into sharp relief when government officials were impicted in poaching in 2005. 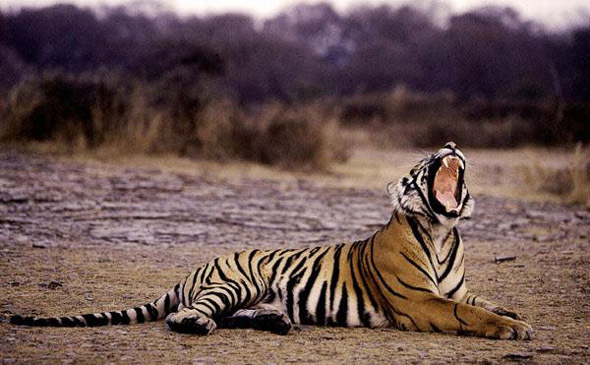 Independent sources estimate the number of tigers as of early 2006 to be about 15. Aside from the enormous Ganesh Mela (fair) in August, traffic into the park is highly restricted. Even though the remaining tigers are used to being observed that they’re not scared away by jeeps and canters. In Ranthambore, seeing a tiger is just a matter of luck, but the park is worth visitig for the scenery, with 300 species of birds in the park. You can walk up to the fort for an enchanting journey. Ranthambore National Park is 10 km from Sawai Madhopur to the first gate, where you pay admission, and another 3 km to the main gate and Ranthambore Fort. Accommodation is spread out along the road from the town to the park. The train station is in thr heart of Sawai Madhopur, just south of main bazaar. The best time to take a wildlife safari in the national park is between October and April. Safaris take place in the early morning and late afternoon. The mornings can be cold, so bring warm clothes. The best way to travel is by jeep, which takes 5 people. You still have a good chance of seeing a tiger from the canter, though sometimes passengers can be rowdy, and the engine tends to roar. Guides will lead you down one of eight allocated routes and negotiating an alternative route with your driver takes clever diplomacy. Seats in both jeeps and canters are allocated on a first-come-first-served basis. Only 15 jeeps and 15 canters are allowed in the park per session, hence demand outstrips supply. A guide is compulsory and is included in the canter ticker price, but will cost an extra Rs 200 if you go by jeep. Tips are heavily encouraged. Internet access, 4km from train station. Cottages are best option, rooftop restaurant is cool with pleasant views. One of the best options. Government run, set on a hilltop, located 7km from station. Newly decorated rooms, lawn area and campfire is lit in winter. 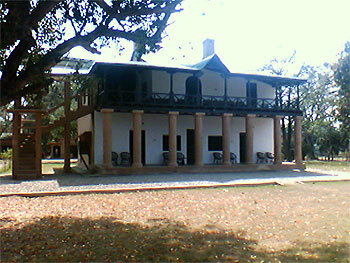 Tak Group lodge, located 3 km from station, once belonged to the Maharaja of Jaipur. Lovely gardens and luxurious. Teak-floored tent is 790 sq. ft. with a jungle décor and freestanding bath. Impressive rooms, long gold-inlaid dining area, monstrous courtyard, located opposite to park entrance, 1km back from Ranthambore Road. Located on Ranthambore Road, about 500m from the train station. The only place to change cash or travellers checks, it’s in the old city and can be reached by a local bus or taxi from near the train station in Sawai Madhopur. Costs Rs 5/70. Located 59 km from Junagadh via Visavadar, this rugged, hilly, 1400 sq. km. sanctuary feels non-commercial and encompasses some beautiful forested land. It was set up to protect lions and since 1980 the numbers have increased from 200 to about 350 in 2006. 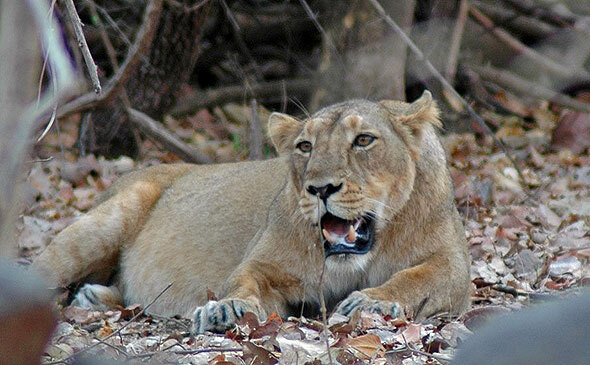 Sasan Gir is not big enough for the number of lions, but moves by Madhya Pradesh government to transfer 200 lions to the Pulpur Kuno sanctuary were canned by the Gujarat government. Apart from the lions there are more than 30 species including leopards, foxes, hyenas, board, crocodiles, peacocks, monkeys and deer, and the largest Indian antelope – nilgais. The best time to visit is from December to April and it’s closed from mid-June to mid-October depending on the monsoons. STC buses travel resularly between Junagadh and Veraval. There are buses to Veraval (local/express Rs 12/20, 1.5 hours, hourly) and to Junagadh (Rs 20/30, 2 hours, 59 km). Trains run to veraval (Rs 10, 1.5 hrs) and Delwada (for Diu, Rs 20, 3 hours). You’d probably be unlucky not to see at least one lion on a safari. If you’re determined to se one, allow a couple of trips. Unfortunately, the lions retreat into the undergrowth during Indian holiday season when the convoys of jeeps roar through the park. Before you go on a safari, you must get a permit that are issued on the spot at the Sinh Sadan Forest Lodge Office and are valid for the whole day. It’s best to hire a guide that costs Rs 50 or US$10. Jeeps carry a maximum of 6 passengers and costs US$ 10. Although prices are quoted in US$, payments are in rupees. Try and take a jeep rather than aminibus, because the latter sticks to the main tracks, jeeps can take small trails, where you’re more likely to spot some lions. A good place to see crocodiles – from baby to adult – there are around 100 bred here. Admission is free and hours are from 8.30am to 6pm. The chances of seeing lions here are good. Located 12 km from the Sasan Village at Devalia, this is a 4sq. km. zone home to the Gir wildlife. Vehicles run here from Sasan Gir’s main street for Rs 150 and is a 30-45 minutes tour. Swimming pool, 3 km from Sasan Gir, lovely rooms. Taj Group hotel. Rooms have balconies and beautiful views. Good restaurant. Thalis cost Rs 35. Local guide Nitin Ratangayra has family house (Tel: +91 285 285686; double Rs 100-200; 3 rooms). He arranges excellent village tours. Located 18km from Sasan. The core is bounded to the North by the Kanda Ridge, with a height of 1043 m at its highest point. The entire area of the reserve is mountainous and falls in the Shivalik and Outer Himalaya geological region. It forms the catchment area of the Ramganga, a tributary of the Ganga. The Ramganga flows from East to West in the reserve through landscapes of incredible beauty. Dammed at Kalagarh at the south-western end of the reserve in 1974. The reservoir created, submerged 40-sq. km. of prime grassland. The area on the western side of the reservoir now constitutes the Sonanadi Wildlife Sanctuary. After India attained independence in 1947 the park was renamed as Ramganga National Park. In 1956, it was renamed as Jim Corbett National Park, in memory of Jim Corbett. Project Tiger, India’s ambitious conservation program to save the tiger and its habitat was launched from Corbett in 1973. Sight-seeings are down to chance as the 130 or so tigers in the reserve are neither baited nor tracked. Your best chance to see a tiger is late in the season – April to mid-June when the forest cover is low and animals come out in search of water. Notwithstanding tiger sightings, few serious wildlife enthusiasts will leave disappointed as the park has a variety of wildlife and birdlife in grassland, forest and river habitats, and a beautiful location in the foothills of the Himalaya on Ranganga River. Commonly seen wildlife include elephants – about 300 live in the reserve, bears, langur monkeys, peacocks, otters, deers, sambars, leopards, crocodiles, gharials and monitor lizards. The Ranganga River attracts large number of birds, especially from min-December to end of March. Dotted around the parks are machaans 9observation towers) overlooking water holes which you can climb to watch the wildlife. Be sure to bring binoculars and plenty of mosquito repellent and mineral water. Departure at 10.40 pm from Old Delhi Railway Station. Arrival at 5.00 am at Ramnagar Station. * Avoid wearing perfumes and do not smoke in restricted areas. * Animals are extremely weary of the human voice. Don’t make noise, don’t play music and please don’t honk car horn. The main reception centre is located on the main road in Ramnagar, opposite the bus stand. The main entry points for the park are Amdanda Gate (for Bijrani Visitor Centre), 1.5 km north of Ramnagar and Dhangiri Gate (for Dhikala), 18km north of Ramnagar. Dhikala, 51 km northwest of Ramnagar and deep inside the reserve, is the main accommodation centre within the park’s core area, but it’s only open to overnight guests, or as a part of a tour booked through he reception centre at Ramnagar. Two hour elephant safaris (Indian/foreigner Rs 150/250, 4 passengers per elephant) are available at Dhikala, Khinnanauli, Gairal and Jhirna Gate at 6am and 4pm on first-come-first-served basis. Entry permits are bought at Dhangiri gate for Dhikala and at Amdanda Gate for day trips to Bijrani. In the off-season (June 15 to Nov 15) you can only enter through Jhirna Gate. However, from October 15 to November 15, day cisits are permitted through Amdanda Gate (rs 200 + jeep & guide fees). During the seaon the entry fee (Indian/foreigner Rs 50/450) covers three days. The jeep fee is Rs 100 at Bijrani and Rs 150 at Dhikala, and a compulsory guide fee of Rs 150. Jeeps can be hired in Ramnagar and a half-day safari should cost around Rs 600 per jeep and Rs 1200 for a full day, which excludes the entry fee. 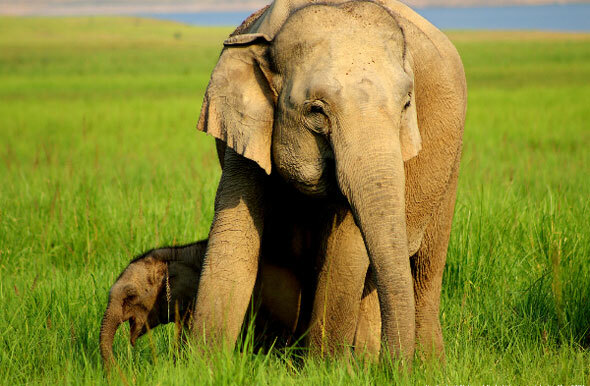 This means that a full day safari for two people including an elephant ride costs Rs 3000. Check with your hotel reception for prices and bookings before hiring a jeep. For serious wildlife viewing, Dhikala, deep inside the reserve, is the best place to stay despite the high prices. Rates given inside the reserve are for foreigners, Indian pay less than half! The town of Ramnagar has budget accommodation, while upmarket resorts are strung out along th road skirting the eastern side of the park between Dhikuli and Dhangari Gate. Offer 24 basic beds (no bedding supplied). Hutments offer best accommodation and sleep upto six people. If you for VIP accommodation, the Old Forest Rest House (room Rs 3000), the New Forest Rest House (room Rs 2600) and the two cabins (Rs 2600) can be booked through the Chief Wildlide Warden (Tel: +91 135 2644691) in Dehra Dun. The Annexe ( Rs 1200) can be booked through KMVN in Delhi. Meals and elephant rides available. Good location in the reserve’s core area.